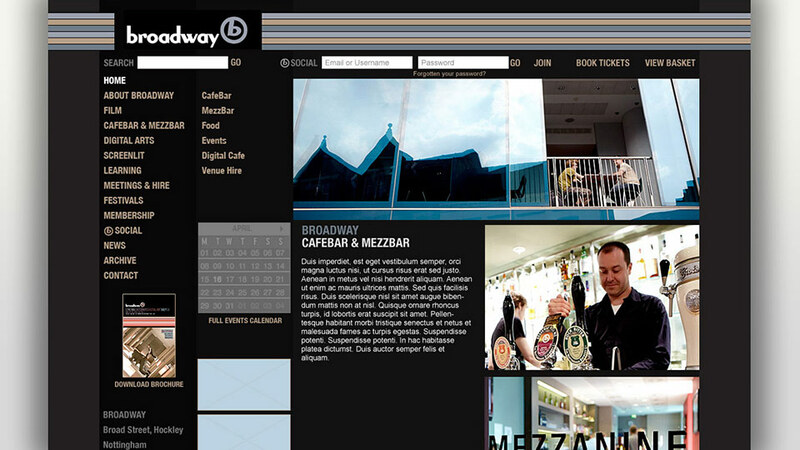 In the same year that Apple launched the iPad, Broadway Cinema were looking to redesign an under-performing ticketing website. With Mobile Apps gaining in popularity the time was right for adopting a mobile-first approach to web design. 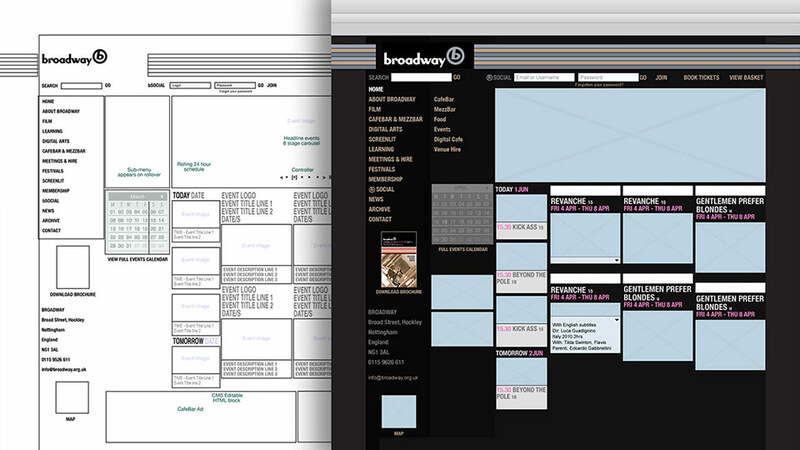 Armed with little more than a foamex mock-up of the iPad, I pitched with marketing partner Lavanya Sivakumaran against a line-up of competing designs that looked accomplished yet were little more than brochureware re-hashes of Broadway’s existing website. 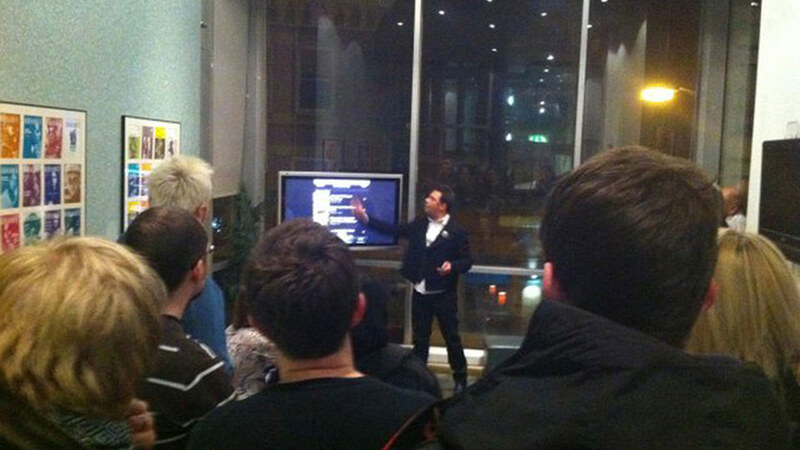 Our ‘mobile-first’ proposal centred on a far-reaching integrated solution that would include a native app for iPhone. The App, the first of it’s kind for an independent cinema demanded a complete rethink of the organisation’s online marketing strategy, involving input from colleagues at Victoria Creative. 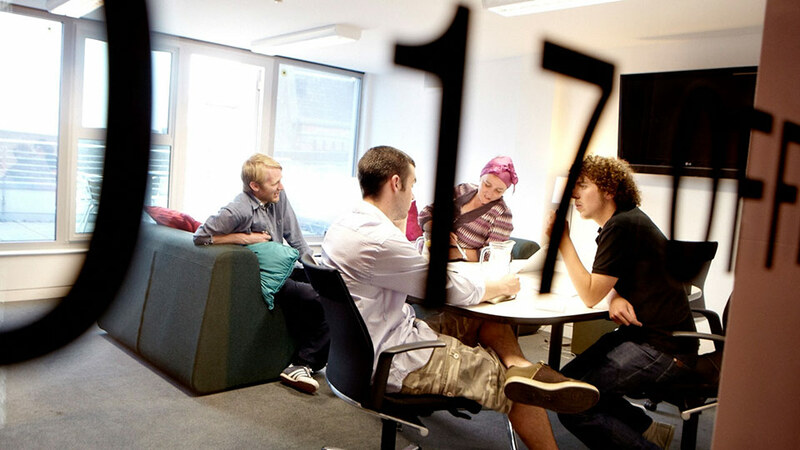 As the lead Digital Producer, I was responsible for stakeholder engagement, UX deliverables, and co-ordinating the technical build by partners Cuttlefish multimedia. It was a pleasure to work with Broadway’s Senior Management Team led by CEO Steve Mapp and Audience Engagement Officer Andy Batson who were very receptive to our challenging ideas. On a personal level I was also proud to give something back to a venue that introduced me to classic British cinema as a teenager. The production process involved stakeholder interviews, sketching, cluster maps, personas and SWOT analysis. It was important to gather the opinion of a wide cross-section of people involved in the venue, from front-of-house staff, to creative tenants, members and casual visitors who frequented Broadway’s café and bar facilities. All aspects of branding, design and business objectives were carefully considered to help position the venue as one of Europe’s leading independent cinemas and digital arts venues. This comprehensive review included work with database and merchant integration which had a profound impact on back-office processes, as long-standing administrative issues were resolved by introducing fresh CMS functions into the e-commerce solution. Design and build took several months to complete, with iterative user-testing of prototype designs by stakeholders. Some brave decisions were made by the Senior Management Team, including approval of a design which they had originally rejected but had subsequently gained unanimous support of users during the UX testing and consultation phase. The home-page includes a dynamic calendar of events displayed in a masonry style, against a black cinematic-styled background and Broadway’s distinctive candy-stripes running across the top. A simple feature built into the CMS is the ability to change the entire colour palette so that the stripes matches seasonal colour schemes that appear across marketing collateral such as posters and flyers. The iPhone App was made available on the Apple App Store and launched in parallel with the new website at a special media event at the end of 2010. 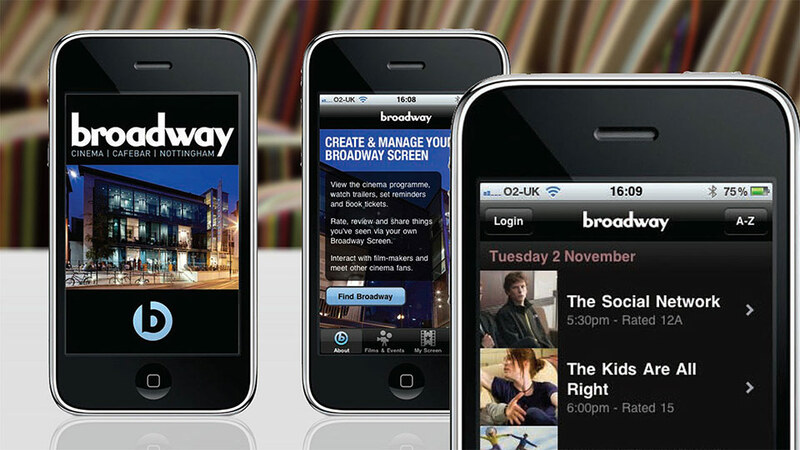 Broadway Cinema, Nottingham were the first independent cinema in the UK to launch their own iPhone App. Ultimately, Broadway’s commitment to mobile-first design and UX testing paid off. 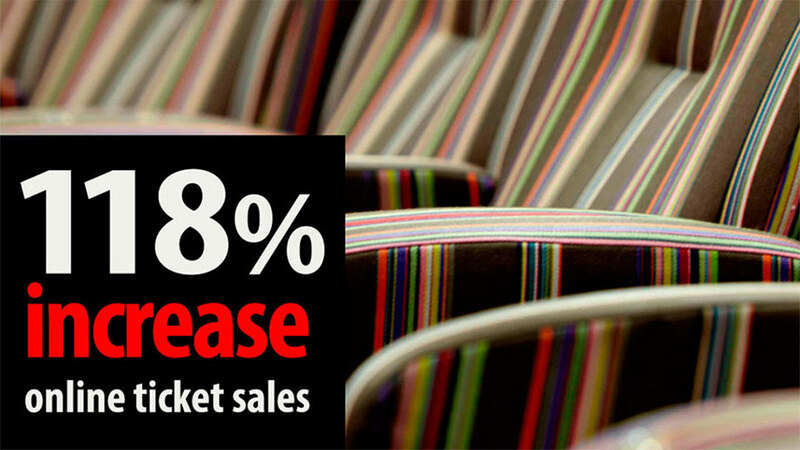 In 2011, annual reports confirmed that online ticket sales had risen dramatically by 118%. 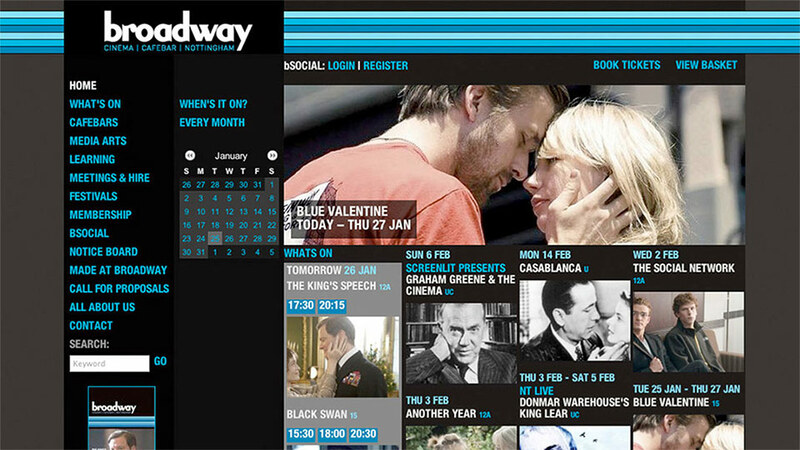 Broadway Cinema e-Commerce Website and iPhone App. Audience Development Officer: Andy Batson.